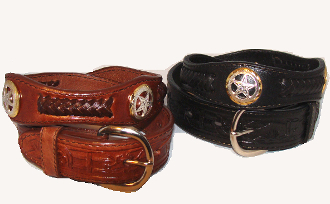 Tooled LEATHER WITH WESTERN STAR CONCHO. Keep in mind when ordering, IF YOU ARE REPLACING THE STANDARD BUCKLE WITH YOUR OWN WESTERN BUCKLE, this will add another 1 1/2 to 2" to the length depending on your buckle width. we suggest using a leather hole punch to make additional holes in the belt.